DIE Veneris, videlicet, 29 die Aprilis. L. Lovelace Leave to be absent. to be recommended for it. and about Fielder the Sheriff of Hampshire's Petition, for being molested at Portsmouth, in proclaiming the Writ for summoning L. Digby to appear. L. Digby's Business to be debated Tomorrow. Delinquents from Portsmouth sent for, on Fielder's Complaint. Message from the H. C. with a Letter of Sir John Hotham's giving an Account of the Affair at Hull. Lords Lieutenants to issue Commissions to the Deputy Leutenants and Officers in the Militia. Report from the Committee, about Ships for Ireland. and to transmit Lady St. John's Business to them. Attorney General's Petition, that he may be released. Any Petition concerning him to be presented between the Hours of 10 and 12. Etherington and Family, Leave to go beyond Sea. 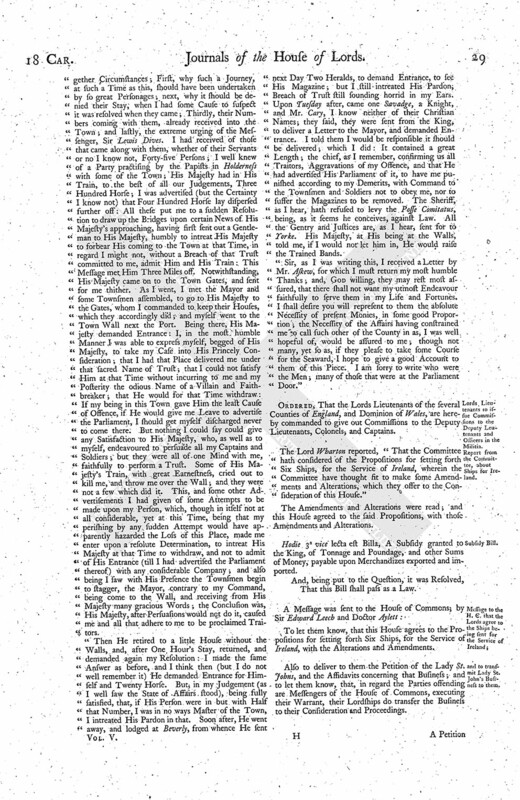 Inigo Jones's Impeachment, concerning St. Gregory's Church. George Benyon to be examined in Lady Hastings's Cause against Mr. Poulton. Ordered, That the Lord Lovelace hath Leave of this House to go into the Country, to settle his Affairs, and afterwards to return and attend this House. Upon reading the Petition of John Hackett, Doctor in Divinity, One of His Majesty's Chaplains, shewing, "That he hath been Twice recommended, by His Majesty's Letters, to a (fn. 1) Canon Residentiary's Place in the Church of St. Paul's, London, which is now vacant:" It is Ordered, by the Lords in Parliament, for the Reasons aforesaid, and for the Desert and Worth of the said Doctor Hackett, That he be hereby specially recommended to the Dean of the said Church, Mr. Doctor Mountfort, Mr. Doctor Turner, the Residentiaries of the said Church, and all others that have Vote in the said Election, that thereby he the said Doctor Hackett may be elected into the said Place, now vacant as aforesaid. To let their Lordships know, that the House of Commons, looking upon the late Business of Hull, do conceive it to proceed from the Effect of some former Counsels of the Lord George Digby, and Letters sent to the Queen and Sir Lewis Dyves from him, whom they have impeached formerly of High Treason; and their Lordships having sent out a Proclamation Writ, to summon him to appear at a certain Day, under a Pain of Conviction; and it being now Six Weeks since, and the said Lord George Digby not being come in, according to the said Proclamation, to render himself; the House of Commons therefore desires their Lordships would please to assign a Day, when they shall come up to demand Judgement against the said George Lord Digby. 2. The House of Commons sent up a Petition of John Feilder, Esquire, now High Sheriff of the County of Hampshire, some Particulars whereof concern the Privileges of this House; which is, that the Sheriff of Hampshire, proclaiming the Proclamation Writ at Portsmouth, for summoning the Lord George Digby to appear before this House at a certain (fn. 2) Time, to answer his Accusation of High Treason, he was interrupted by divers Persons in the said Service, and had reproachful Speeches given him for the same. All which the House of Commons offers to their Lordships Consideration, to do therein as they shall think fit. Hereupon this House Ordered, To take the Business concerning the Lord Digby into Debate To-morrow. Ordered, That Mr. Winter, Deputy Mayor of Portsmouth, Anthony Haberley, and John Triggs, shall forthwith, upon Sight of this Order, repair to Westm. and make their Appearance before the Lords in Parliament; and that John Feilder, Esquire, Sheriff of the County of South'ton, shall, at their said Appearance, produce his Witnesses for the making good of those Things that are charged against (fn. 2) them; and hereof all Parties mentioned in this Order are to take Notice of this, and make their Appearance accordingly. That their Lordships will appoint a Day speedily, to consider of the Business concerning the Lord Digby; and then they will (fn. 3) give the House of Commons Notice of it. And touching the Petition of the Sheriff of the County of South'ton; their Lordships have taken Order that the Parties shall appear, to answer their Offences, to this House. A Message was brought from the House of Commons, by John Hampden, Esquire, and others; who presented to their Lordships Consideration a Letter, directed to the Speaker of the House of Commons; and, although there be no Hand subscribed, yet there are many Members of the House of Commons that know it to be Sir John Hotham's Hand-writing, and is a true Narrative of the Business concerning Hull. "Upon Friday the Three and Twentieth of this Instant April, an Alderman of Hull came to me, and told me he was newly come from Yorke; and that he was to give me Notice, that the Duke of Yorke, the Prince Elector, and my Lord of Newport, would that Night come to Hull, and stay only One Night, next Day go back to Yorke. I could have well wished they had taken some other Time; but, being very desirous to give all the Content I could (my Trust always preserved), I gave Way to their Reception, and had provided next Day at Dinner to have given them the best Welcome I could; but late that Night, I had some Cause of Suspicion that they meant not to depart the next Day; whereupon I went to my Lord Newport, who assured me confidently it was not so, which a while satisfied me, till, about Nine a Clock, the Duke, Prince, and the rest, being walking in the Fort called The South End, Sir Lewis Dives comes in thither, and delivered me a Letter from His Majesty, purporting that He intended to visit His Town of Hull, and His Magazine there; that I should provide for the Reception of Him and His Train; doubted not of my Obedience, else He must make His Way into His Town, according to the Laws of the Land. This, I confess, put me to a great Straight: On the one Side, being most extremely sorry to give His Majesty the least Cause of Offence; on the other Side, the Breach of a Trust being in my Sense so horrid a Fact, as after that I should not have wished to live. I then began to put to gether Circumstances; First, why such a Journey, at such a Time as this, should have been undertaken by so great Personages; next, why it should be denied their Stay, when I had some Cause to suspect it was resolved when they came; Thirdly, their Numbers coming with them, already received into the Town; and lastly, the extreme urging of the Messenger, Sir Lewis Dives. I had received of those that came along with them, whether of their Servants or no I know not, Forty-five Persons; I well knew of a Party practising by the Papists in Holderness with some of the Town; His Majesty had in His Train, to the best of all our Judgements, Three Hundred Horse; I was advertised (but the Certainty I know not) that Four Hundred Horse lay dispersed further off: All these put me to a sudden Resolution to draw up the Bridges upon certain News of His Majesty's approaching, having first sent out a Gentleman to His Majesty, humbly to intreat His Majesty to forbear His coming to the Town at that Time, in regard I might not, without a Breach of that Trust committed to me, admit Him and His Train: This Message met Him Three Miles off. Notwithstanding, His Majesty came on to the Town Gates, and sent for me thither. As I went, I met the Mayor and some Townsmen assembled, to go to His Majesty to the Gates, whom I commanded to keep their Houses, which they accordingly did; and myself went to the Town Wall next the Port. Being there, His Majesty demanded Entrance: I, in the most humble Manner I was able to express myself, begged of His Majesty, to take my Case into His Princely Consideration; that I had that Place delivered me under that sacred Name of Trust; that I could not satisfy Him at that Time without incurring to me and my Posterity the odious Name of a Villain and Faithbreaker; that He would for that Time withdraw: If my being in this Town gave Him the least Cause of Offence, if He would give me Leave to advertise the Parliament, I should get myself discharged never to come there. But nothing I could say could give any Satisfaction to His Majesty, who, as well as to myself, endeavoured to persuade all my Captains and Soldiers; but they were all of one Mind with me, faithfully to perform a Trust. Some of His Majesty's Train, with great Earnestness, cried out to kill me, and throw me over the Wall; and they were not a few which did it. This, and some other Advertisements I had given of some Attempts to be made upon my Person, which, though in itself not at all considerable, yet at this Time, being that my perishing by any sudden Attempt would have apparently hazarded the Loss of this Place, made me enter upon a resolute Determination, to intreat His Majesty at that Time to withdraw, and not to admit of His Entrance (till I had advertised the Parliament thereof) with any considerable Company; and also being I saw with His Presence the Townsmen begin to stagger, the Mayor, contrary to my Command, being come to the Wall, and receiving from His Majesty many gracious Words; the Conclusion was, His Majesty, after Persuasions would not do it, caused me and all that adhere to me to be proclaimed Traitors. "Then He retired to a little House without the Walls, and, after One Hour's Stay, returned, and demanded again my Resolution: I made the same Answer as before, and I think then (but I do not well remember it) He demanded Entrance for Himself and Twenty Horse. But, in my Judgement (as I well saw the State of Affairs stood), being fully satisfied, that, if His Person were in but with Half that Number, I was in no ways Master of the Town, I intreated His Pardon in that. Soon after, He went away, and lodged at Beverly, from whence He sent next Day Two Heralds, to demand Entrance, to see His Magazine; but I still intreated His Pardon, Breach of Trust still sounding horrid in my Ears. Upon Tuesday after, came one Savadge, a Knight, and Mr. Cary, I know neither of their Christian Names; they said, they were sent from the King, to deliver a Letter to the Mayor, and demanded Entrance. I told them I would be responsible it should be delivered; which I did: It contained a great Length; the chief, as I remember, confirming us all Traitors, Aggravations of my Offence, and that He had advertised His Parliament of it, to have me punished according to my Demerits, with Command to the Townsmen and Soldiers not to obey me, nor to suffer the Magazines to be removed. The Sheriff, as I hear, hath refused to levy the Posse Comitatus, being, as it seems he conceives, against Law. All the Gentry and Justices are, as I hear, sent for to Yorke. His Majesty, at His being at the Walls, told me, if I would not let him in, He would raise the Trained Bands. "Sir, as I was writing this, I received a Letter by Mr. Askew, for which I must return my most humble Thanks; and, God willing, they may rest most assured, that there shall not want my utmost Endeavour faithfully to serve them in my Life and Fortunes. I shall desire you will represent to them the absolute Necessity of present Monies, in some good Proportion; the Necessity of the Affairs having constrained me to call such other of the County in as, I was well hopeful of, would be assured to me; though not many, yet so as, if they please to take some Course for the Seaward, I hope to give a good Account to them of this Piece. I am sorry to write who were the Men; many of those that were at the Parliament Door." 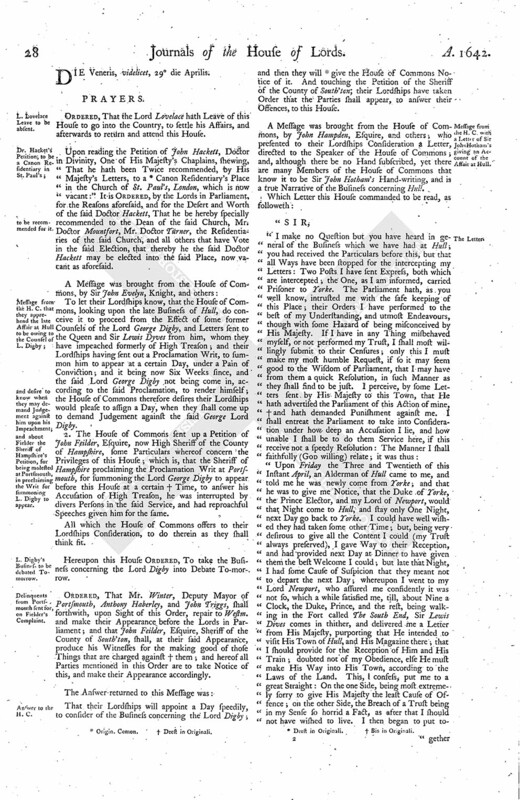 Ordered, That the Lords Lieutenants of the several Counties of England, and Dominion of Wales, are hereby commanded to give out Commissions to the Deputy Lieutenants, Colonels, and Captains. "The Lord Wharton reported, "That the Committee hath considered of the Propositions for setting forth Six Ships, for the Service of Ireland, wherein the Committee have thought fit to make some Amendments and Alterations, which they offer to the Consideration of this House." The Amendments and Alterations were read; and this House agreed to the said Propositions, with those Amendments and Alterations. Hodie 3a vice lecta est Billa, A Subsidy granted to the King, of Tonnage and Poundage, and other Sums of Money, payable upon Merchandizes exported and imported. And, being put to the Question, it was Resolved, That this Bill shall pass as a Law. To let them know, that this House agrees to the Propositions for setting forth Six Ships, for the Service of Ireland, with the Alterations and Amendments. 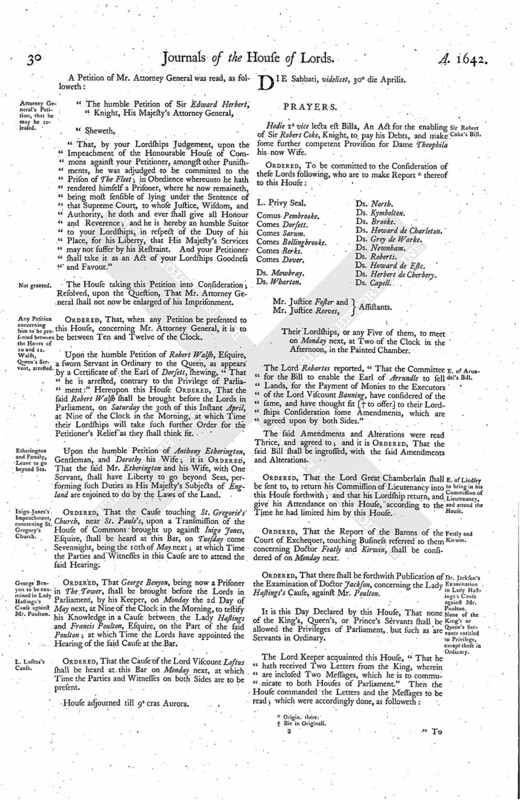 Also to deliver to them the Petition of the Lady St. Johns, and the Affidavits concerning that Business; and to let them know, that, in regard the Parties offending are Messengers of the House of Commons, executing their Warrant, their Lordships do transfer the Business to their Consideration and Proceedings. That, by your Lordships Judgement, upon the Impeachment of the Honourable House of Commons against your Petitioner, amongst other Punishments, he was adjudged to be committed to the Prison of The Fleet; in Obedience whereunto he hath rendered himself a Prisoner, where he now remaineth, being most sensible of lying under the Sentence of that Supreme Court, to whose Justice, Wisdom, and Authority, he doth and ever shall give all Honour and Reverence; and he is hereby an humble Suitor to your Lordships, in respect of the Duty of his Place, for his Liberty, that His Majesty's Services may not suffer by his Restraint. And your Petitioner shall take it as an Act of your Lordships Goodness and Favour." The House taking this Petition into Consideration; Resolved, upon the Question, That Mr. Attorney General shall not now be enlarged of his Imprisonment. Ordered, That, when any Petition be presented to this House, concerning Mr. Attorney General, it is to be between Ten and Twelve of the Clock. Upon the humble Petition of Robert Walsh, Esquire, a sworn Servant in Ordinary to the Queen, as appears by a Certificate of the Earl of Dorsett, shewing, "That he is arrested, contrary to the Privilege of Parliament:" Hereupon this House Ordered, That the said Robert Walsh shall be brought before the Lords in Parliament, on Saturday the 30th of this Instant April, at Nine of the Clock in the Morning, at which Time their Lordships will take such further Order for the Petitioner's Relief as they shall think fit. Upon the humble Petition of Anthony Etherington, Gentleman, and Dorothy his Wife; it is Ordered, That the said Mr. Etherington and his Wife, with One Servant, shall have Liberty to go beyond Seas, performing such Duties as His Majesty's Subjects of England are enjoined to do by the Laws of the Land. Ordered, That the Cause touching St. Gregorie's Church, near St. Paule's, upon a Transmission of the House of Commons brought up against Inigo Jones, Esquire, shall be heard at this Bar, on Tuesday come Sevennight, being the 10th of May next; at which Time the Parties and Witnesses in this Cause are to attend the said Hearing. Ordered, That George Benyon, being now a Prisoner in The Tower, shall be brought before the Lords in Parliament, by his Keeper, on Monday the 2d Day of May next, at Nine of the Clock in the Morning, to testify his Knowledge in a Cause between the Lady Hastings and Francis Poulton, Esquire, on the Part of the said Poulton; at which Time the Lords have appointed the Hearing of the said Cause at the Bar. Ordered, That the Cause of the Lord Viscount Loftus shall be heard at this Bar on Monday next, at which Time the Parties and Witnesses on both Sides are to be present. House adjourned till 9a cras Aurora.